Happy Wednesday Everyone! How are you doing today? 1. I got a new camera! My first DSLR! It's a entry level and basic DSLR called Canon Rebel T5. It's light weighted and pretty compact compared to other huge DSLRs. Perfect choice for someone who wants to start getting into advanced photography. This bundle comes with a zoom lens and a camera bag and it's affordable. I'm looking to get another lens for an addition. It's called Canon EF 50mm f/1.8 STM Lens. Which is a very popular prime lens! It's bright lens and so useful in many ways! It makes photos so pretty and it's at a great price! I think this will be the main lens for my new camera! I am so excited for my new adventure with this camera! I've always loved taking pictures since I was little. And recently I've rediscover my lost passion of photography! I'm so happy that I found my passion again! It's like finding your lost love and falling in love all over again! I took some photos past days and I still need to practice and get used to it. 2. Focusing on Eating Healthy again! I'm thinking about another post just about this. I was eating quite healthy for like 4 years I think. But last 2 years, I had eaten unbalanced and unhealthy. So as my life too. I'm trying to find balance with my diet and my life back to good health! It is so important that we take care of our health since our body and mind are so connected. I wouldn't consider this a really healthy stuff but a better choice! I usually prefer natural foods that are not processed or minimally processed for healthy eating. Eating nuts and seeds for crunchy cravings would be the best choice for healthy snacking. And there's always a better choice, like this chips right here from Late July! They are organic and gluten free with chia seeds, quinoa, amaranth and more! My favorite one is the Blue corn one. So yummy! It is so nice to have a healthy grocery store like Lassen's near by. They opened up couple of moths ago. It's like Wholefoods Market but smaller. And they got Kombucha on Tap. YES! Kombucha is so healthy for you! Kombucha can be little strong taste to some people. But Kevita has awesome flavors like Lavender Melon I tried the other day! So give health food a chance and give it a try! Maybe you can get two and try with your friends! 3. I touched the street cat for the first time! I've been feeding them every single day from January. One night, I heard a cat crying desperately I usually ignore and sleep. I looked out the window and the cat was right in front me with those big teary eyes. I don't know how the cat knew I'm an animal lover or I had some food ready to give. That night 2:30 am in the middle of my sleep I went out and gave them their first meal. They were not even there. But after I came in I heard them eating and in the morning the plate was so empty clean! Ever since that night I make them fresh and healthy home cooked meal every night. Some nights I was so discouraged that they don't even show themselves. But little by little, they started interact with me. One of them started meow back at me after months I've been meowing at them and they started waiting for me at the dinner time. And finally the one cat started eating off my hand and let me touch him or her but still with so much cautions. They delight me so much. Such a blessing to be able to help them! They get so happy whenever they see me and I'm so happy to see them happy! Two of them were so little back then and they are getting bigger. There used to be 4 of them. I think the big one was mom. She died. And one medium sized one has been missing almost two weeks. 4. Happy was featured on Dogs of Instagram! Dogs of Instagram (instagram.com/dogsofinstagram) has 1.5 Million Followers! 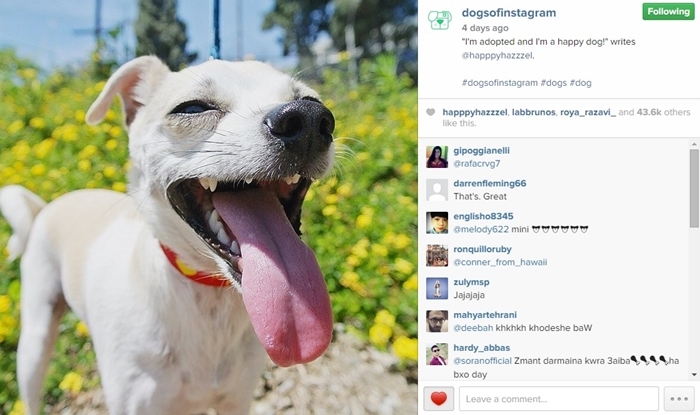 It's the most popular and famous Instagram account for Dogs. Happy got over 43600 likes! Just so amazing! We've been really loving the Instagram's Dog Community. So many sweet dogs and owners are so kind and loving. we get so much positiveness and encouragements back to us! 5. Planning on a new website! I've been brainstorming about this for a while. And since I got the new camera, it's coming closer to making into reality. I will be all done by me. Like this blog. This is the base design for the logo. Maybe I'll be adding a palm tree? !